Regular readers of Steel Curtain Rising’s Watch Tower know the column has been particularly harsh on the mainstream press lately. While the Watch Tower’s purpose is to cast a critical eye on the Steelers press converge, that doesn’t mean such commentary needs to be negative. In fact, in many cases that Watch Tower has been quite complementary. But there’s a pattern of non-coverage of important stories emerging here, and one that deserves deeper discussion. Recently the Watch Tower took aim at both the Post-Gazette and Tribune Review’s decision to completely ignore Doug Legursky’s defection to the Bills. And for good reason, the decision to let Legursky leave could come back to haunt the Steelers given the need to protect Ben Roethlisberger. The motives behind the Steelers decision deserve to be discussed. Unfortunately, this non-coverage is not an isolated example. Former Dallas Cowboys Pro Bowl Punter Brian Moorman signed with the Pittsburgh Steelers on April 30th. The news was picked up by a mix of professional and fan based sites, ranging from Behind the Steel Curtain to NBC’s Pro Football Talk. The under-the-radar signing for the Steelers this off season came two days after the draft ended and barely made a ripple in the news cycle…. Was Fittipaldo attempting to make amends for his paper’s omission a legitimate news story, or was it just coincidence? Steelers Nation will probably never know, but the issue raises some very relevant questions as to the purpose and role of the sports pages of the traditional dailies in the internet age. If A Free Agent Leaves But The Papers Don’t Covers It, Does It Make A Sound? The Mooreman’s signing is only the latest in a series of news stories that have gone un or under covered by either the Pittsburgh Post Gazette and/or the Tribune Review. Last year Mewelde Moore signed with the Colts with only a brief mention in PG Plus. Steve McLendon was wooed by the Packers, which was reported by the Post-Gazette, but the decision to resign him was not, save for something on PG Plus. Former Steelers coach Bill Austin passed away earlier this off season. While the Tribune Review’s Alan Robinson wrote something on his death, the Post Gazette published a Bloomberg News article written by someone else who listed Ed Bouchette as a contributor. Let’s give the devil his due, and discuss possible reasons for why these stories got no coverage, because they do appear to be deviations from editorial policy. For example, the potential and then actual departures of Will Allen and Ryan Mundy were fully covered by the major Pittsburgh dailies. Both moves were legitimate news involving minor players. In contrast, however, both Moore’s departure in ’12 and Legursky’s loss in ’13 arguably represented losses of more significant contributors. One possible explanation is that both Allen and Mundy’s departure’s occurred in heat of free agency, where as Moore and Doug Legursky left after the draft during the NFL’s only true off season when attention ebbs. While that fact may mean decreased public interest in the stories, it does nothing to make them less newsworthy. 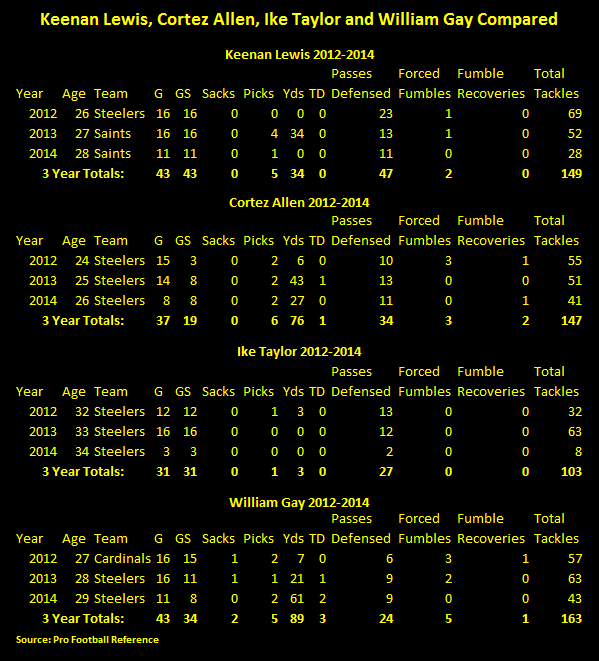 Similar (potential) explanations exist for the non-coverage of Isaac Redman and Steve McLendon’s signings. Both occurred days before the NFL Draft, an event whose coverage has taken on monstrous proportions of its own. But again, does this justify non-coverage? Hardly. Losing McLendon would have all but forced the Steelers to draft a defensive lineman in the first or second round. The fact that this possibility went off the table when Redman signed his tender was news. It deserved coverage. What Is the Role of a Daily? Steelers fans of course had myriad other means to learn of this information, via Twitter, fan sites, ESPN and sports talk radio. What is the purpose of the sports section of a major newspaper? Most dailies (at least the Pittsburgh dailies) don’t offer the types of in depth analysis pieces that you find on fan based sites like Behind the Steel Curtain (full disclosure, I also write for BTSC). Presumptively the reason is because they feel their focus should be on more traditional “news” stories that can be tied conversations with the newsmakers themselves. That’s a defensible position from a purely journalistic perspective, although one that is likely not a sustainable digital age strategy for two complimentary reasons. First, fan bases’ appetite for “content” on their favorite teams remains nearly boundless. The second relates to the bottom line – profitability and page views go hand-in-hand in the digital world. But the traditionalist journalism argument completely falls flat when dailies simply begin ignoring legitimate news stories. Because if the dailies fail to make themselves “one-stop-shops” supplying all of the basic news about a particular team in an objective format (as opposed to team websites) then fans both can and will stop visiting their sites…. …The Watch Tower very much wants to see traditional newspapers make the transition to the digital age, and in that vein it suggests that the editors of the Post-Gazette and Tribune Review have a little soul searching to do. The Pittsburgh Steelers and Max Starks are breaking up. Could it be for real this time? Yes, folks, it looks like it is. Long time Pittsburgh Steelers tackle Max Starks went through the first round of free agency without attracting any interest for other teams or from the Steelers themselves. The Steelers then went out an signed Guy Whimper, leading to speculation that Wimper’s arrival meant Starks’s departure (speculation later confirmed as explained in the Watch Tower). Max Starks has had a longer, and stranger trip than perhaps any Pittsburgh Steelers save for Ernie Holmes. Drafted in 2004 with Ben Roethlisberger, Starks was a starter for the Steelers in Super Bowl XL. Yet, by the end of 2006 coaches were attempting to phase him out in favor of Willie Colon. The coaches and the front office could not decided what they wanted to do with Starks, leading to him getting transition tenders, franchise tenders and the like – when he wasn’t even starting. Yet Starks delivered for the Steelers. He played well of the bench in 2007, saved their 2008 Super Bowl season, and again bailed the Steelers out in 2011 – after they had cut him. Starks may never have been or will be an All Pro Tackle, but he certain did what was asked of him in Pittsburgh. Thanks Max. Steelers Nation is in your debt. A few days after coming to terms with safety Shamarko Thomas, the Steelers signed inside linebacker Vince Williams, who was their 6th round pick in the 2013 NFL Draft. Williams will compete with Adrian Robinson, Chris Carter, Stevenson Sylvester and perhaps Sean Spence to for a roster spot to provide depth behind Larry Foote and Lawrence Timmons. They say breaking up is hard to do. The Pittsburgh Steelers and free agent tackle Max Starks can attest. The Steelers have had a love-hate relationship with Max Starks since drafting him in 2004 that has seen the front office offer him a transition tender only to see the coaches start the season with Starks on the bench. That was in 2008, and Starks bailed out the team and helped lead them to victory in Super Bowl XLIII. One of the team’s first moves after the NFL 2011 lockout was to cut Max Starks. Starks was of course back in October, going from walking the streets to starting on consecutive Sundays. Word was that when the Steelers drafted Mike Adams in the second round of the 2012 NFL Draft their hopes were that Adams would replace Starks. But when it became clear in training camp that Mike Adams wasn’t quite ready to take over the reigns and left tackle, Starks was signed again. Pittsburgh is thin at tackle, and Starks is still available, but again he’s not the preferred option, as the Steelers have signed veteran tackle Guy Whimper as reported a few days ago by the Pittsburgh Post-Gazette. Whimper was originally drafted by the New York Giants in 2006 and played the last three seasons for the Jacksonville Jaguars. Behind the Steel Curtain, (full disclosure, I also write for BTSC) labled the signing as curious, citing a Football Outsiders J.J. Cooper’s analysis that had Whimper giving up sacks in nine straight games in 2011. Interestingly enough, Cooper started 15 games in 2011 but was not a regular starter in 2012 and in fact was listed as a tackle/te in Pro Football Reference. Whimper was signed for the league minimum, so the Steelers can easily cut him in training camp if he does not work out. And who knows, perhaps Max Starks will be available to replace him. Emmanuel Sanders signing, a run on Steve McLendon, Isaac Redman staying in Pittsburgh. And that doesn’t even count the 2013 NFL Draft. It has been a busy few weeks in Pittsburgh, and this edition of the Watch Tower shines its light on how those stories were (or weren’t covered) by the Steelers press corps. Don’t blame Emmanuel Sanders next season if he pulls a Greg Lloyd like black out of the Pittsburgh media, because if the Pittsburgh Chapter of the Pro Football Writers Association were calling the shots, Manny Sanders would be an New England Patriot now. Can’t agree with anguish of #Steelers fans. And I really can’t understand the Patriots here. Give me the third-round pick for Sanders. Ed Bouchette wrote a full length story declaring that keeping Sanders would be a bigger risk for the Steelers than letting him go, and labeling the choice a “no brainer.” For Mark Kabloy of the Tribune-Review, the one year nature of the Sanders tender was the deal breaker. To find Love for Sanders, you have to go to Peter King of Sports Illustrated who devoted points 6 and 7 of his “Ten Things I Think I Think” of his MMQB column to the Sanders situation. First he blasted New England for its half-hearted, short term offer to Sanders, and praised Sanders, citing his team-high 14.2 yards per catch average. After the Steelers matched New England’s offer for Sanders, Dale Lolley immediately told his readers to expect a long-term deal to be worked out. Not so fast, shot back Sanders agent Jordan Woy, indicating that Sanders had “several offers” from NFL teams. Whether he plays for them beyond that is problematic, and the Steelers had to know that when they decided to keep him for another year. But were there really teams lining up to throw money at Sanders? The average fan has no way of knowing, and relies on beat writers for that insight. Unfortunately, Ed Bouchette offered none. He writes as if the multiple offers for Sanders were a matter of fact, yet gives his readers zero indication as to whether he has verified this claim with any sources, be they named or unnamed. The Watch Tower has praised Ed Bouchette for his journalistic acumen before and no doubt will again, but the Post-Gazette’s readers deserved more from the “Dean” of the Steelers press corps on this one. In fairness, though, Bouchette at least covered that aspect of the story whereas the Tribune Review appears to have ignored it. Steelers Nation got a jolt last week when news broke that the Green Bay Packers were working out starting nose tackle Steve McLendon, in news broken by the Baltimore Sun via Twitter. Both Mark Kalboy and Ed Bouchette commented on the story via Twitter. Behind the Steel Curtain wrote a story on the visit and then a follow up suggesting that the Packers might simply be trying to pressure their own nose tackle B.J. Raji into extending his contract. In contrast, the Pittsburgh Tribune Review printed nothing on the story. A look at their main Steelers page as of 2:00 pm Eastern on Saturday 4/20/13 reveals nothing at all on Steve McLendon. Nothing on his visit to Green Bay, nothing on the 3 year deal that the Steelers signed him to. There’s not even a comment on their Steel Mill blog. The Trib’s writers did comment on McLendon via Twitter to be sure, but offered nothing to readers hungry for more than 140 character bites of information on a story with major implications for the Steelers defense in 2013. The Tribune Review earns a big, black mark for its non-coverage of the McClendon story. The other X Factor in the Steelers restricted free agent situation was Isaac Redman. They’d been rumors that a team might make a run on him, but nothing serious got published to that effect and probably for good reason as Redman signed his restricted free agent tender on Thursday evening without getting an offer. Not that you would have found out about it by reading the Tribune Review, Post-Gazette, or even Behind the Steel Curtain. Mark Kalboy did report the news via Twitter, but Redman remains a popular player in Steelers Nation, and his assured return means that he figures to be a major part of the Steelers rushing offense in 2013 and those two facts should have warranted more substantial coverage. Early in the month news of the Steeles pre-Draft visits flowed freely, and it was clear that they were evaluating a lot of linebackers. Then suddenly, the news stopped. This is not the first time the Steelers have tried to keep their pre-draft visits secret. Ed Bouchette shared this news with his readers a few off seasons ago on PG Plus, although if memory serves, he was able to uncover and publish the identities of several visitors. Perhaps he did the same this year on PG Plus. Again, as PG Plus won’t take Watch Tower’s money, I have no way of knowing. The average fan has little way of gauging whether it is easy or hard for reporters to find out who is making visits to the Steelers in advance of the 2013 NFL Draft if the Steelers refuse to announce those visits. But readers should have been informed of the news black out, instead of simply suffering a sudden stop of information. Shortly after news broke that Alameda Ta’Amu had pleaded guilty to a number of counts stemming from last fall’s drunken rampage on the South Side took a cheap shot. Ta’amu was unfortunate enough to have a friend tweet an old photo of him holding a liquor bottle in the back seat of a car. Ta’amu made matters worse by being dumb enough or at least inattentive enough to retweet it. The website Steelers Depot pounced on the move, suggesting that Ta’amu was out the night before “celebrating” his relatively light sentence, and later updating the post suggesting that the fact that Ta’amu had his “friend” take down the photo was an admission of guilt. However, as Neal Coolong of Behind the Steel Curtain pointed out, the photo was taken during the day and during the spring or summer, lending credibility to Ta’amu’s insistence that the photo was an old one. Steelers Depot’s suggestion little more than a cheap shot, and BTSC deserves credit for calling them out on it. What does James Harrison share with Neil O’Donnell not to mention John Jackson, Myron Bell, Oliver Gibson, and Jamain Stephens? If you guessed that he was an ex-Steelers who wound up as a Cincinnati Bengal then you’d be spot on. Allen Robinson of the Pittsburgh Tribune Review is reporting that the Cincinnati Bengals signed James Harrison to a 2 year contract. Terms were not disclosed, although it is likely for less money than he left on the table when Steelers tried to get him to accept a 30% pay cut. When Harrison balked, the Steelers cut him, and Harrison has been trying to land a job with another AFC North team since then. Harrison himself tweeted the news, showing he’s already incorporating lingua franca of The Jungle into his vocabulary. In an trivial twist to the story, Behind the Steel Curtain is citing an ESPN report that says that Harrison will not actually sign the contract until May. With the acquisition of Harrison, Cincinnati cements what is one of the more underrated defenses in the NFL. Unlike Pittsburgh, the Bengals play a 4-3 and how Harrison exactly fits in is unknown but the Bengals already have formidable players such as Gino Atkins, Michael Johnson and Carlos Dunlap in what is one of the strongest front 7’s in the league. James Harrison still has something left. He may not be the player he was in 2008 or even 2010, but Harrison has something in the tank. And nobody thrives on motivation like James Harrison. If you doubt it, just watch the Steelers 75 Anniversary game where he essentially ended Steve McNair‘s career as a starter. That cannot be a reassuring thought for Ben Roethlisberger, who must doubling down on his rosary decades, praying that the investments the Steelers have made in Marcus Gilbert, Mike Adams, and David DeCastro pay off in the form of them developing into players capable of protecting him. The ink had barley dried on Steve McLendon’s new contract when news broke Steelers Nation could officially stop worrying about a run its remaining restricted free agents. Mark Kaboly of the Pittsburgh Tribune Review reported via Twitter that the Isaac Redman had signed his restricted free agent tender, binding him to the Steelers for 2013. Its been 3 years since an NFL restricted free agent had gotten an offer from another team, but the Steelers found themselves at the focal point of not one but two restricted free agent poaching attempts. The first one involved Emmanuel Sanders, with New England making an offer to Sanders which the Steelers ultimately, and surprisingly matched. Then followed the news that Steve McLendon worked out in Green Bay, prompting the Steelers to quickly Steve McLendon offer him a three year contract. Rumors and rumblings had it that there were also teams interested in Isaac Redman. Those fears can now be put to rest. Redman of course made the key touchdown in the Steelers stunning come from behind victory vs. Baltimore in 2010, and by 2011 had proven himself as a capable NFL back up. Redman’s best shot at a stardom came in 2012 with the injury to Rashard Mendenhall, however Redman himself was injured during the first part of the season, and did not recover until late in the season. Redman will now get a second chance and, if the Steelers are smart and cap space allows it, they’ll offer him a multi-year deal during training camp. No Isaac Redman is not the second coming of Franco Harris or Jerome Bettis. But he’s a gritty, scrappy back who like Merril Hoge and Mewelde Moore before him, has a motor that simply does not quit. Fortuantely that motor will be running for the Pittsburgh Steelers for one more year.